Cassagnau has been a family-owned property since the eighteenth century but it owes its longevity to the women of that family. Today the estate is run by Jacques Abet (he refers to himself as a medical doctor by profession, but vigneron by passion). Cassagnau is located in Limoux , in the Languedoc which is a region that benefits from the influence of Mediterranean and Atlantic climates. The Mediterranean influences make for generous wines, with the sunshine providing ripeness, while the westerly influence maintains the humidity and freshness that is necessary for the fruit to express itself fully. Rounding out the picture is the diversity of the soils: gravel terraces with large round pebbles predominate on the low slopes hidden in the foothills of Pyrenees. 45% Cabernet Franc, 33% Cabernet Sauvignon and 22% Malbec. The grapes were harvested in the cool hours of the morning and vatted for just a few hours before being “bled” to achieve a must with just a slight hint of pink. The must is then fermented and aged briefly in tank on the fine lees. 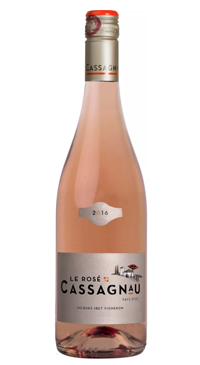 This is a fresh and vibrant rose that captures the essence of the Languedoc sun in the summer. The bouquet is floral with hints of citrus and spice. The palate has the typical freshness of Cabernet and a delicate mouthfeel highlighted by invigorating minerality.